Motorized window shades offer unparalleled convenience, as you can open and close them with just the press of a button. 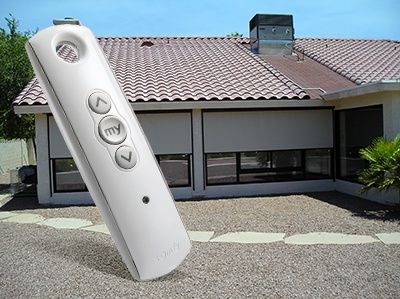 At Polar Shades, we strive to make adding a new remote to your window shade automation system just as easy as pressing an existing remote’s button. In fact, all you need to do to add a new remote is press a few buttons. Here’s a step-by-step guide to the process. Adding a new remote to an existing automation system just requires copying the necessary programming information from a current remote and pasting it to a new one. Before starting the copying and pasting process, make sure each remote is operating on the proper channel. Channels are used to organize window coverings with their controllers. If you’re using a single-channel remote, there is no need to worry about what channel it’s on, since it only has one. If you’re copying from or pasting to a multi-channel remote, navigate to the correct channel on the remote by pressing the channel-select button. Take the paperclip, tiny screwdriver or similar object and press the programming button. Continue to hold the programming button until the shades jog (move up and down slightly). The programming information is now copied, and it’s ready to be pasted into your new remote. Simply repeat the steps on the new remote, pressing and holding its programming button until the shades jog again. The new remote is now programmed, and both remotes will control the window shades. You’re all set to use them. If you’d like the convenience motorized window shades offer but have been wary of programming hassles, there’s no reason to delay looking at shades. You can see the entire process in this video. Alternatively, find your local Polar Shades dealer, and you can see for yourself how easy it is to program new remotes.